The AcoustiCase achieves its objective through sheer brute force - heavy steel and masses of sound deadening material. It has been carefully designed to thoroughly dampen fan and drive noise whilst ensuring safe cooling of all PC internal components. The AcoustiCase™ C6607 is a quality built PC case designed with quietness in mind and boasts a unique combination of anti-vibration features and pre-cut acoustic sound dampening materials. According to Ferrago.com, "The AC6607 is a superbly made product" and PC Pro Magazine says, "it does a surprisingly good job of reducing PC noise". 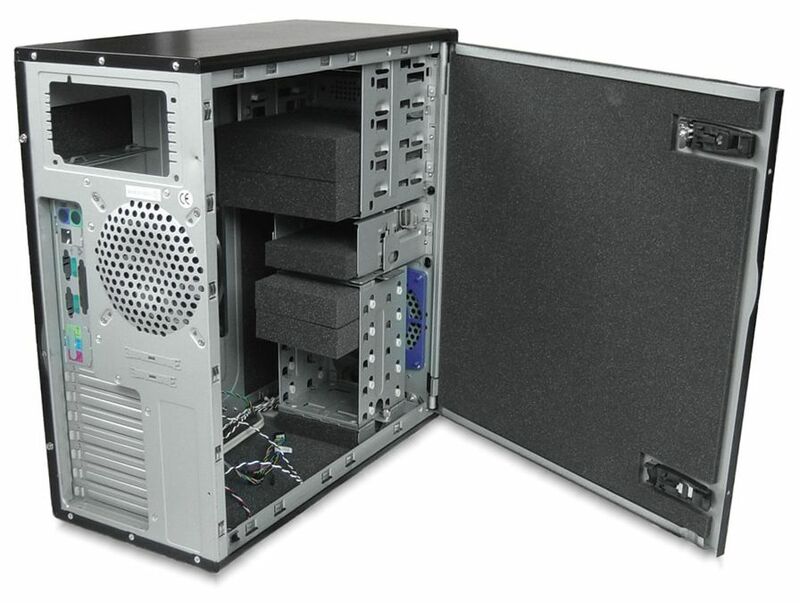 Once fitted with acoustic materials and containing quiet components this case will make a very cool and quiet system and is well suited for air-cooled computers with multiple hard disk drives requiring good, dust free airflow. The AcoustiCase™ super-midi ATX tower case is coated in a fingerprint-resistant high quality matt black finish. The build quality is exceptional with all removable cages fitted securely, preventing annoying rattles and hums. In addition, all edges have been rounded making this case a joy to work with. 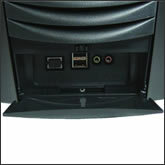 Internally the AcoustiCase™ is spacious and has a "no tool" easy open side panel for quick access. 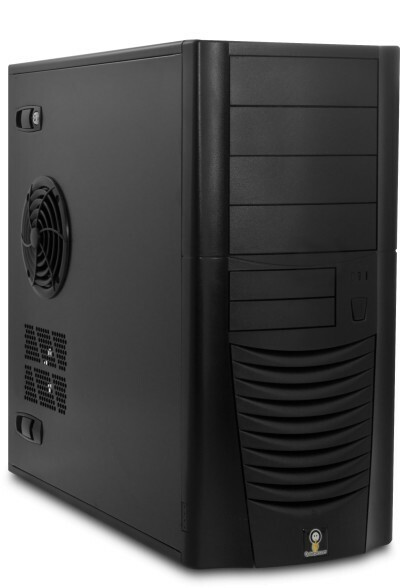 This quiet PC case is supplied with pre-cut specialist soundproofing materials with comprehensive fitting instructions for easy assembly. The acoustic materials have been carefully designed to optimise acoustic dampening whilst allowing the air flow necessary for cooling. These pre-cut acoustic materials are specially designed by Acousti Products and are made from the highest quality professional studio-grade materials. They are non-shedding and therefore do not crumble or generate dust as they age. Their high density improves sound absorption, ensures a low flammability performance and allows for the dual-layer composite that is used to line the sides of the case. For more details on the Acousti Products sound proofing materials click here. 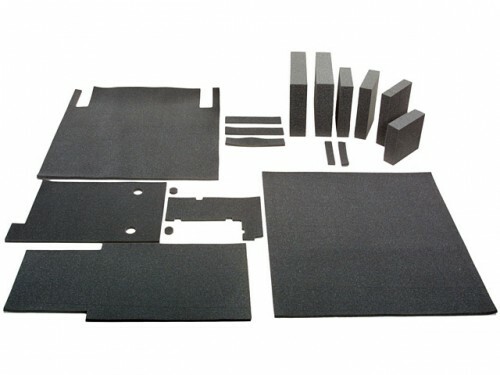 The acoustic materials kit is comprised of no fewer than 16 parts including; pre-cut 7mm self-adhesive acoustic composite parts for lining all four internal walls (including the complete side panel behind the motherboard) and acoustic foam blocks for unused drive spaces for both noise absorption and ducting airflow over installed devices. The kit also comes with soft black fan mounts. 8x ultra-soft anti-vibration fan mounts*. 4x soft black rubber anti-vibration case feet. 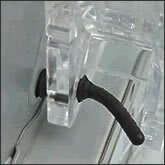 *To install the ultra-soft anti-vibration fan mounts, the two fan brackets should be removed. See the bottom of this page for further fitting instructions. The case can accommodate 2 x 120mm fans (not supplied). Click here to see our range of quiet PC case cooling fans. The above image shows the accessible 3.5 inch drive cage for easy installation of compact fan controllers, card readers etc. 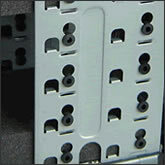 The front Firewire, USB and audio ports are mounted on a quality mini-PCB towards the base of the front of the case. Instructions for fitting soft black fan mounts. Remove the “hold-fast" fan brackets from inside the case. To do this, unscrew the retaining screws. 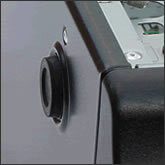 Thread 4 black fan mounts from outside the case through the larger of the two case fan mounting holes. 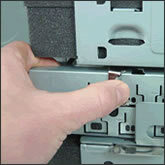 Gently pull the fan mounts into position, so they are held in place by the case and face inwards. Position the 120mm case fan inside the case (remember to check the fan airflow direction at this point! ), so that the mounting holes on the fan match up to the 4 fan mounts, and they poke through the fan mounting holes. Starting with the mounts furthest away from you, gently pull the fan mounts through the fan mounting holes, until they hold the fan in position with the arrowhead. The fan will now operate in physical isolation from the chassis, significantly reducing any vibration transmission from fan motors and moving parts. The AcoustiFan™ 120mm fan gaskets (AFG120B) are not compatible with this case. We recommend that any 120mm case cooling fans are mounted using the anti-vibration ultra soft fan mounts supplied with the case (see above). Cable Includes UK mains cable and a Quiet PC badge!